Woody climbing vines get a bad name for their invasiveness and ability to cover desirable landscaping. They do have their niche though. Chocolate vine is an aggressive climber and can provide a dense screen in just a few years. It grows as far north as Michigan and New England but is more adaptable to southern climates. In our area it often retains its foliage year-round, but from central Virginia northward it loses its leaves and wouldn’t provide much privacy in winter. 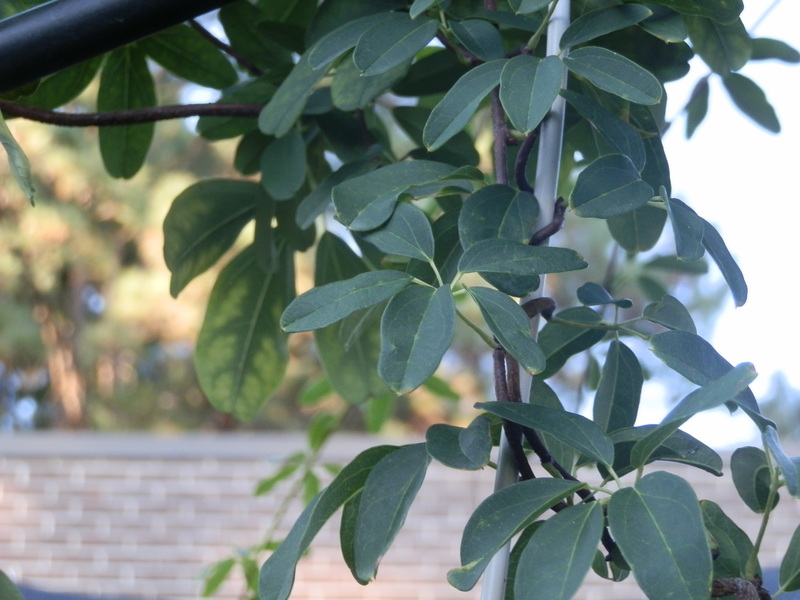 Leaves emerge from the stem one at a time and are what we call palmate. They are composed of five blades in a circular pattern. For this reason it is often called five-leaf akebia. Stems climb by twining themselves around any available object. Vines can get 40 feet tall and once established, can make that growth in one year. 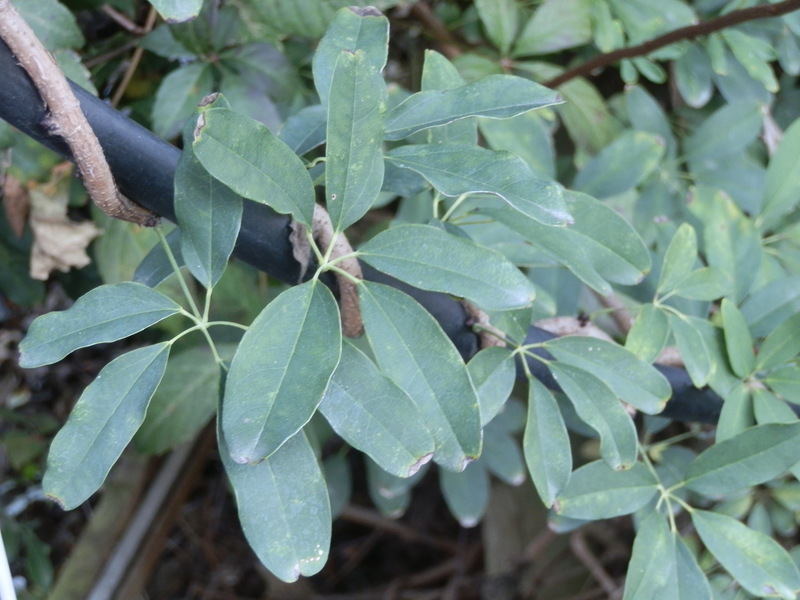 Plants are readily propagated by leaf cuttings. Flowers are either purple or white. They have a delicate chocolate odor if you use your imagination. Purple-flowering types are more likely to be fruitful, but plants won’t set fruit unless pollinated by a different plant. 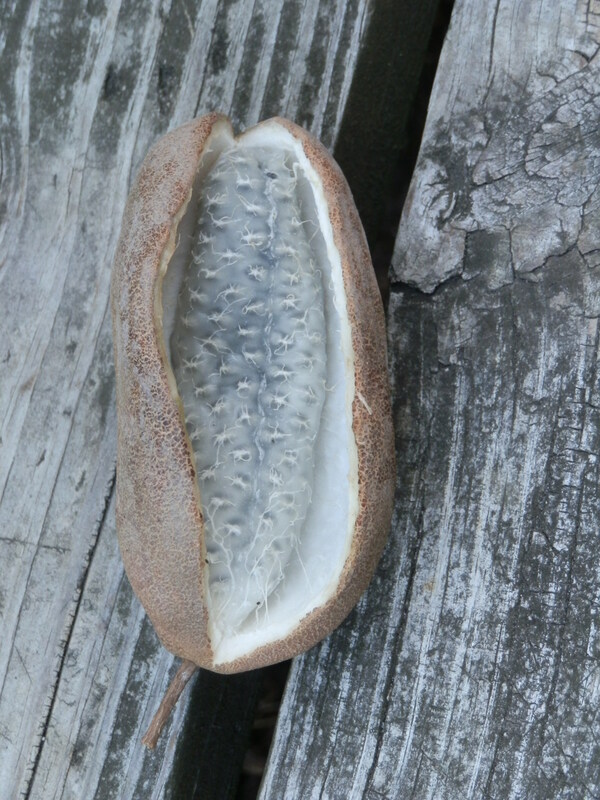 Fruits resemble clusters of link sausages or pawpaws and when mature have a sweet taste and texture reminiscent of tapioca pudding. 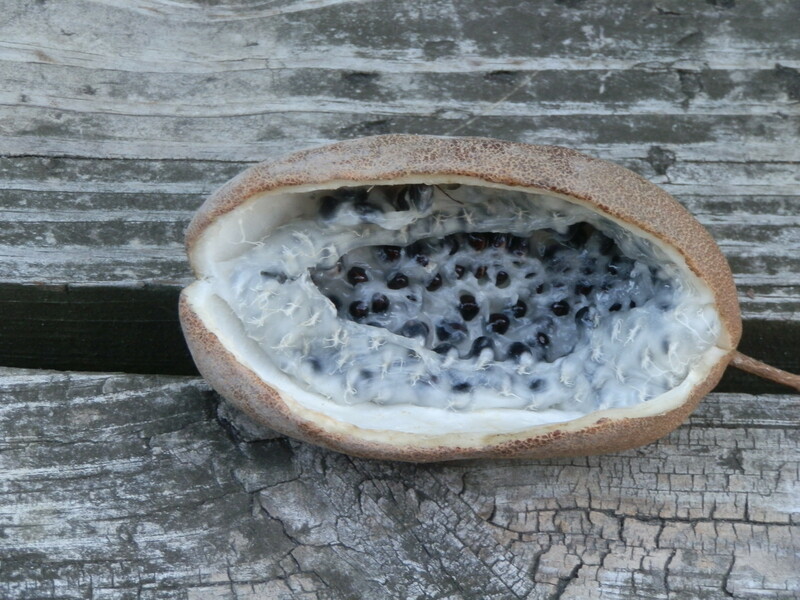 When fruits ripen they split open and expose numerous dark seeds in a gelatinous white material. No, they are not poisonous. Birds and other animals eat the sweet fruits. Seed will spread and take hold wherever sunlight is adequate and soil moisture is not excessive. Should there not be something to climb, this vine will form a dense ground cover. Leaves can be steeped into tea and stem extracts have been used for urinary tract ailments and throat problems on a minor scale. This plant originated in Asia and those cultures have used it as a medicinal herb much more than herbalists have in this country. Chocolate vine seems to thrive on pruning, much like grapes do. Healthy new growth rapidly replaces older material and makes the plant branch more. Gardeners may feel free to severely cut them back if they spread from where they belong. If homeowners want to eradicate them, there is hope. Young plants are vanquished with foliar applications of a variety of broadleaf herbicides. Glyphosate (Round-up) is also effective at this stage, but you have to be careful and not hit non-target areas. Temperature should be between 55 and 85 degrees for best results. If older vines are the problem, try cutting the stems to the ground. Immediately apply a 20 percent concentrated solution of Round-up to the cut surfaces. This usually does the trick. Another method is to take a string trimmer and girdle the bark from the stem. Applying some concentrated glyphosate-containing product into the stripped wood completes the treatment. Another method for those opposed to chemicals is to trim the vines to the ground and cover them with a piece of old carpet or similar barrier. This will prevent the aboveground parts from growing and starve the roots. They will climb almost anything. 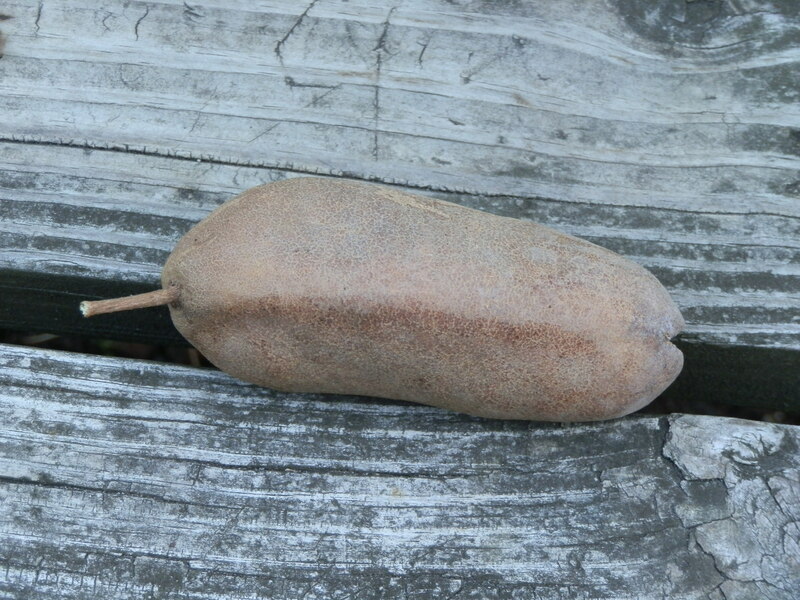 This entry was posted in foraging and tagged Akebia quinata, chocolate vine, climbing vine, edible, foraging, invasive, nature. Bookmark the permalink. we’ve seen and talked about this plant a lot in class, i didnt know that the chocalate vine was edible, andit sounds like it tastes good. Does this plant help with sore throats? i read that it says it helps with minor throat problems, would it be helpful on getting rid of a sore throat though? i think ive seen this before but never knew it had so many uses! I remeber in hort one you told us all kinds of things about this plant its a really pretty and neat plant. This looks nasty, but i didn’t know that this could help with throat probelms. The chocolate vine is a really interesting plant, I never knew that they are edible but i don’t think ill ever try one because they so nasty. i have always thought that this plants fruit looked so gross! we have talked about it many times in class. i also think it is cool how it can be used for many things. I saw this in your class a couple of weeks ago, its interesting how it can help with throat problems. Iwant to try one. Interesting on how this can help esophagaus problems. But i’ve never seen any in the wild! i remember talking about this in class alot..it has some interesting uses. what can you use the chocolate fruit for ? What can you put it in ? and what does it taste like ? Ive heard of this plant before, its Interesting how it can help with throat problems, i never knew that. When i read the title it sounded good but then the text decieved me, but it is interesting how many uses it has for humans even thought it looks gross. The title sounded yummy, but when i looked at the pictures, it changed my mind. It’s cool that this plants can help with sore throats and that it originated in Asia. i touched one before andd it was yuckey.. but i think that its grat how this plant has so many uses, its cool it helps with throut problems. The fruit of plant kind of reminds me of a cat tail. I like the name of this but once i saw the picture it changed my mnd. I never knew that it had so many uses. I’m not too fond of the way it looks but find it very cool that it can have a delicate chocolate odor. these things look like they taste really good. this is an interesting plant especially it helping throat problems. I find it interesting that the leaves of this vine can be steeped into tea and the stem extracts can be used for urinary tract ailments and throat problems on a minor scale. Its good that birds and other animals are able to eat the fruits. Sorry, I’m pretty helpless when it comes to that kind of stuff.